Origin / ancestry Purple Punch Type: Purple Punch is an Indica dominant weed with THC levels up to 25%. Purple Punch is a tasty and powerful treat. It is known to taste like an uplifting dessert. 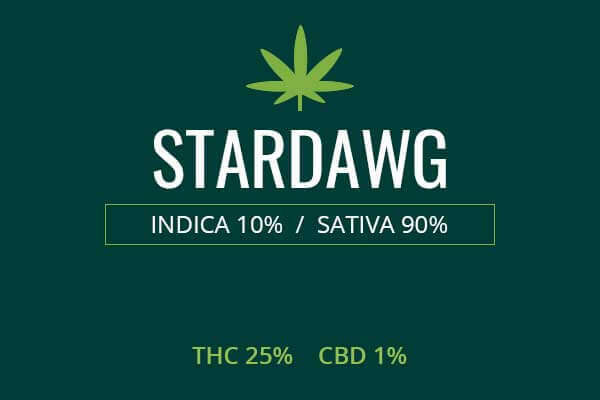 It’s parent Larry OG comes from OK Kush strains. Granddaddy Purple provides delicious flavor and healthy anthocyanins. May Relieve Purple Punch weed is a tasty Indica. It is a great weed to relieve pain, anxiety, depression, and side effects of cancer treatments. Indoor/Outdoor Yield Purple Punch can produce average yields indoors and outdoors. Flowering time Purple Punch plants can take eight to ten weeks to flower. Harvest Purple Punch marijuana plants will be ready for harvest in the month of October. Disease resistance Purple Punch marijuana has strong parents such as Northern Lights and Larry OG. It can be inferred to have high disease resistance. 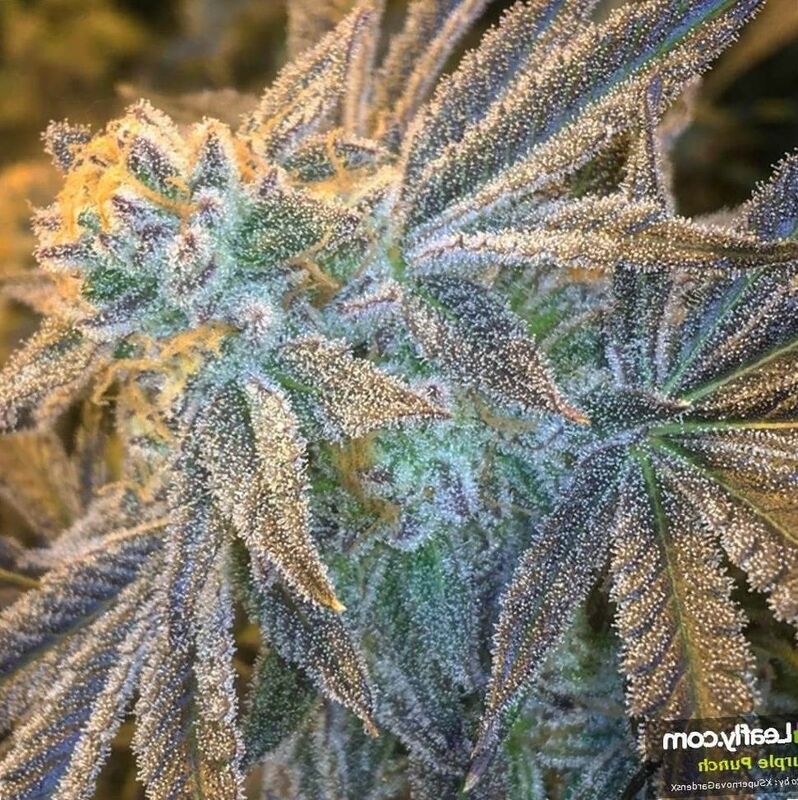 This gourmet weed still has some secrecy surrounding how to obtain seeds and grow your own. 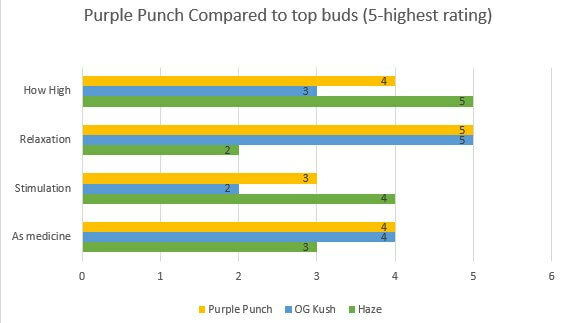 Adverse effects Purple Punch has high THC levels which can lead to dry eyes, dry mouth, and dry hands in overdose. It you overindulge it can also cause a bit of panic. Purple Punch packs a powerful punch of fruity taste. It has grape, blue berry, and tart flavors. It’s parents Larry OG and Granddaddy Purple bestow a hearty resilience and a gourmet flavor. Purple Punch can cause a tremendous dose of relaxation to flow through the body, starting at the top of the head and moving down, tingling with grape goodness. This strain has a strong layer of trichomes divulging a heavy trip of THC. Purple Punch is a true purp, smelling of grape, tropical punch, pineapple, and fruity goodness. 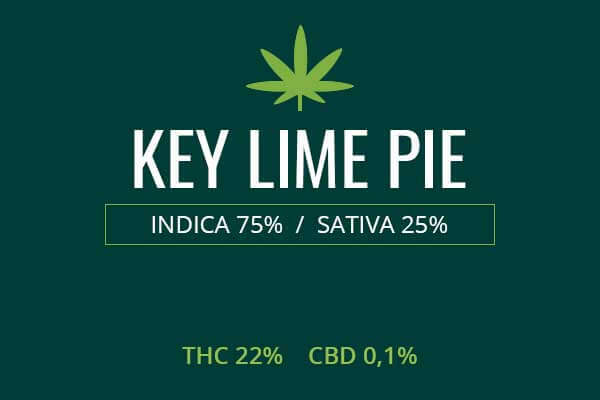 Its main terpene is limonene which also gives a tart, lemon taste. 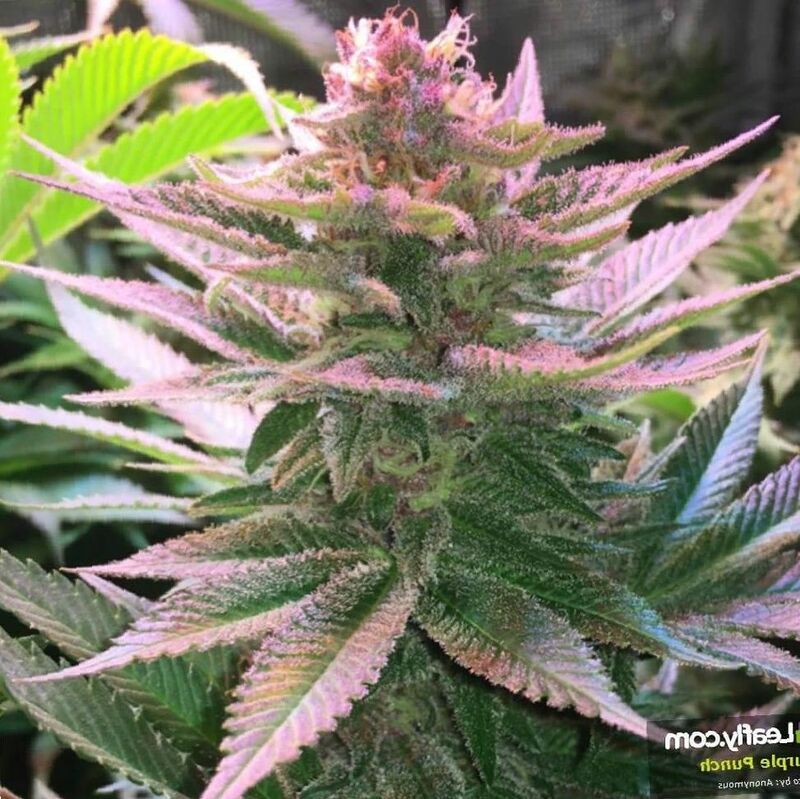 Purple Punch is an average sized plant with colors of green, light yellow green, orange pistils, and purple anthocyanins advertising the great bounty of cannabinoids, terpenes, and THC to be found in the plant. You will get a potent dose of grape fragrance as soon as you open the bag. This tells you of the power in store. This is a heavy weight weed valued on the West Coast for its delicious flavor and strong punch of THC. Growing weed from Purple Punch cannabis seeds is said to be of moderate difficulty. To grow indoors, you want to try to mimic a northern California climate. Balanced humidity and lots of sun. You can use a usual tent set up with high powered lamps providing the light source. 5 gallon buckets of organic soil and nutrients will provide your medium. Be ready to induce flowering in about 8 weeks. Outdoors, you want a sunny, Mediterranean or Californian climate. These are strong hearty plants. They will flower in the month of October. If you are in a region which will give them a handful of cooler nights in October, this will bring out the purple tinge valued by many users. Purple Punch is a tasty Indica with THC levels up to 25%. That means this is a heavy weight medical weed. It’s not for beginners. This is a medical strain which can be used for serious pain. Patients on chemotherapy for cancer treatment can use this weed to address various symptoms. Firstly, there is pain and fatigue associated with both cancer and the chemotherapy and radiation treatment used to treat it. Cancer treatments attempt to kill off cancer cells but produce a lot of collateral damage. This damage can cause illness, pain, fatigue, wasting, nausea, and lack of appetite. First off, Purple Punch has a great flavor for those not used to smoking weed but who still need a weed this strong. These patients have probably taken strong medications already with greater addiction potential than weed, such as high doses of oxycontin and other opioids. Purple Punch gives them an option of treating significant pain without the threat of major tolerance, addiction, and withdrawal. Medical marijuana does not work directly on the opioid system or the GABA system, producing less potential for addiction and withdrawal. Cancer patients will also find the anti-nausea and munchies effects useful. Cancer treatment, chemotherapy and radiation, can both cause severe nausea. 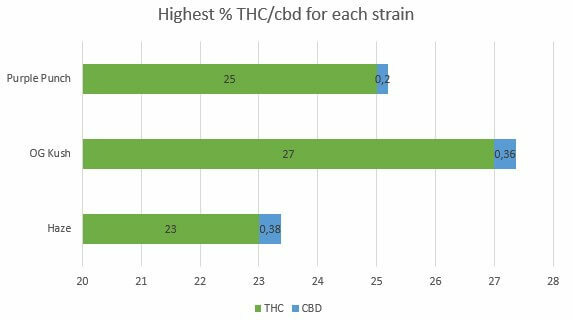 Patients get relief from Purple Punch medical marijuana from nausea and are able to eat and put on weight which gives them a leg up on improving their chances of survival in the long term from this difficult disease. Strain name: Purple Punch – The Heights Co. Acolytes of Purple Punch have reported that this weed is as real head trip. It’s gonna start at the top of the head, massage the temples, get the whole head tingling then move into the body. Then it will lay you flat like a hot iron and leave you sedated and euphoric. 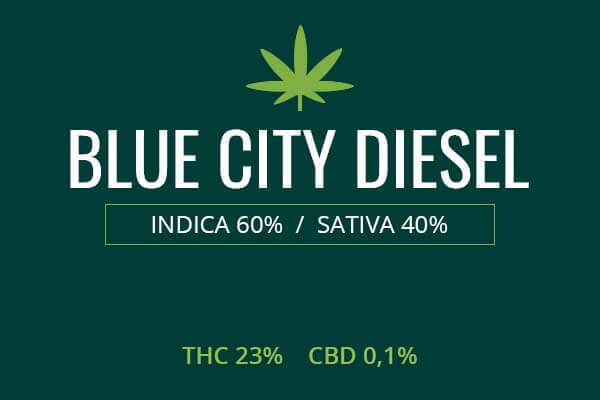 You will want to have some lazy day activities planned like Netflix and chill as you won’t be doing any heavy work after toking up to 25% THC purp Indica weed. You’re gonna wanna sit your giggly body down and relax. You will definitely wanna have some healthy snacks close at hand. Now, chances are, you will start to get a little sleepy, especially if it’s the end of the day or you have already eaten. This is a great post-meal smoke. It may even help you deal with that high blood sugar you have probably put in yourself. 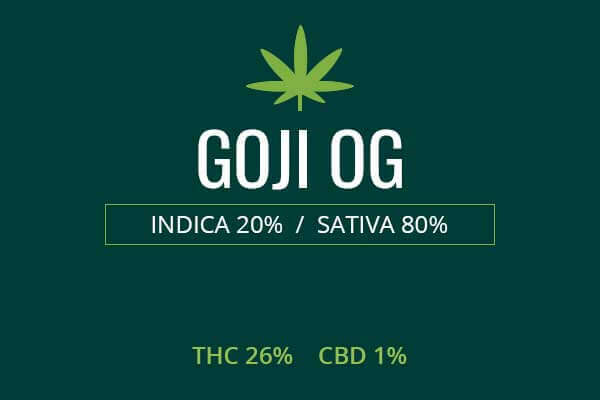 When the pain and tiredness hits from overindulging in eating, you can counter the resultant fatigue with the pain-relieving and mood-boosting effects of this seductive Indica.